FFX-2 is one of the Final Fantasy spin-off games that I've been the most excited to get back to. I remember the basics of the story but the main thing that stood out in my mind from the game is the battle system. Firing up the remastered HD version on my Vita I quickly found that I still love the battle system. It's the fastest and most active version of the Active Time Battle (ATB) system that is found in the majority of Final Fantasy games. I love how dynamic is it too, it allows characters to swap out their class via dress spheres in the middle of the battle. The progression system ties directly into it. Each character can use any dress spheres, but each dress sphere levels up it's abilities separately for each character. You'll naturally start relying on certain characters with certain dress spheres but the system is flexible enough that you could change out all three character's classes at any time, even in the middle of battle. After playing a few hours I realized that I like the story for what it is but I'm not really in the mood for it right now. 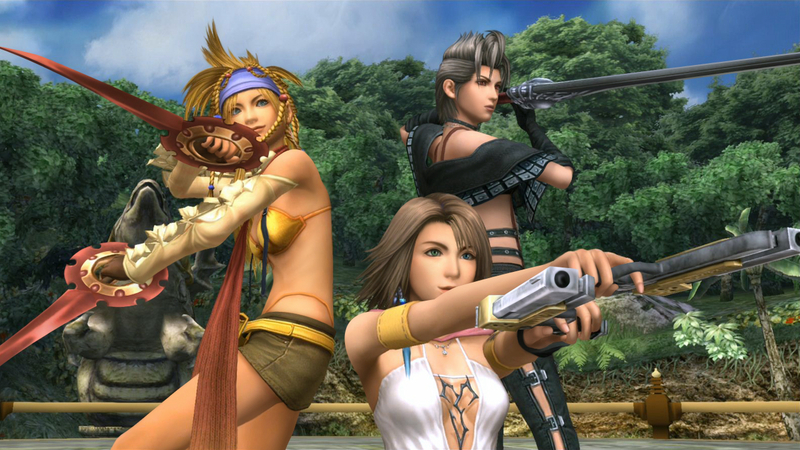 Most of FFX-2 is a girl-power treasure hunting j-pop carefree adventure. The undercurrent is investigating a sighting in a recorded video sphere of Tidus from Final Fantasy X and I remember that storyline has payoff at the end. But, most of the moment to moment in the game is about the carefree treasure hunting adventure. It also reuses a lot of assets from Final Fantasy X and I played FFX not that long ago. There are plenty of unique locations and new takes on existing locations too but I don't particularly want to retread ground that I played through so recently. I still like this game a lot and I'll definitely swing back around to it later when I'm in the mood for this type of story. Honestly, the battle system is so good that it almost carries the game. If you haven't ever played it and you're a Final Fantasy fan you owe it to yourself to check out how great this version of the ATB system is. I'm always excited to see FFX-2 get some love. The story is kinda silly, and I find the musical numbers a bit hard to watch, but it's just so much fun to play! I really think the battle system is the best of any FF game. It's quicker than FFX, and the last game before the series went in the "let the game play itself" direction. The dresspheres are so much fun, and honestly, I love that the girls get so many outfits. Also, though it does re-use most of the locations, I do like getting a chance to go back and visit the characters and places from FFX, see what's been happening since Sin was defeated. I'm in the middle of playing FFX remastered, and will be playing this again soon after.